We’ve talked before about various ways to make money on the side, but how do you succeed at making a few extra dollars while not interfering with your day job? My guest this week is Robert Farrington, of The College Investor. Robert started blogging as a side hustle while he worked a 9-5 career as a manager with Target. Robert explains how he balanced blogging with a full-time job, and how he eventually was able to convert his side hustle into a full-time business. These days, Robert enjoys the flexibility of being able to balance his working hours with other priorities, such as family time. I asked him about a few of his top productivity hacks, including why he schedules time to accomplish specific tasks. 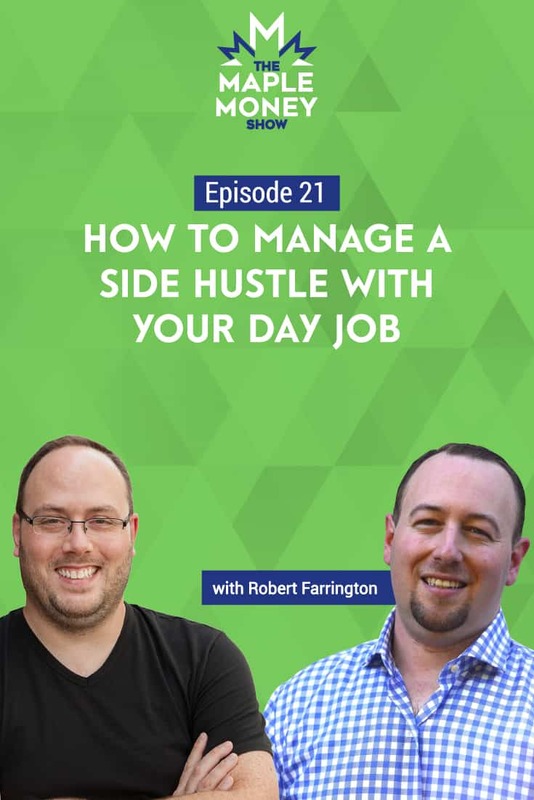 Best of all, Robert shares what he believes is the #1 thing that allowed him to grow his side hustle into a full time business. His answer may surprise you. It’s all here, on the Maple Money Show. This episode is brought to you by our sponsors at Borrowell. Whether you’re looking for a personal loan or a mortgage, it’s important to know your credit score. Borrowell will provide you with your Equifax Credit score, for free, and the process only takes a few minutes. Access your credit score today!